To Cite: Zamiri S, Shaterzadeh Yazdi M J, Maraghi E, Ebrahimi Takamjani I. The Effectiveness of Classification-Specific Physical Therapy for People with Low Back pain Within Dominant Movement-Based Schemes: A Systematic Review, Iran Red Crescent Med J. 2016 ; 18(12):e41959. doi: 10.5812/ircmj.41959. Background: Identification of homogenous subgroups of patients with low back pain (LBP) and classification-based treatment have been recommended by some researchers and primary care clinicians. However, evidence regarding the effectiveness of this approach is not conclusive; one reason for this controversy appears to be the heterogeneity of trials in this context. Methods: The aim of this study was to determine the effectiveness of classification-specific physical therapy in patients with LBP. The included trials were investigated in more homogeneous categories with respect to their classification scheme. Electronic databases including Medline, Cochrane, Ovid, Scopus, and PEDro were searched systematically for English-language randomized controlled trials (RCTs), published from 1980 to October 3, 2015. We included studies on LBP cases, which aimed to compare classification-specific physical therapies with non-specific treatments lacking patient classification. PEDro scoring was used to check the quality of the included trials, and the GRADE approach was used to evaluate the overall quality of evidence. Data on participants’ characteristics, sample size, and inclusion/exclusion criteria were extracted to obtain an overview of the included RCTs. Results: A total of 12 RCTs were identified and categorized into four classification schemes. Some evidence supporting classification-specific treatment was found in each of the schemes. However, the reported evidence was conflicting predominantly due to differences in the study design. Also, GRADE quality assessment indicated the low quality of evidence for both approaches. Conclusions: Categorization of trials based on their classification scheme to investigate the efficacy of classification-based physical therapy could reduce the heterogeneity of trials and allow researchers to understand the contradictory results in this context. Low back pain (LBP) is a prevalent condition with considerable negative effects on individuals, their families, and society (1-4). LBP imposes an enormous annual financial burden and causes disability around the world (5-9). Considering its clinical importance, a large number of studies have been dedicated to LBP over the past decades. Despite great research considerations, it seems that there are no significant clinical outcomes, and recurrent LBP is still responsible for the considerable rise in healthcare costs in the past two decades (10-12). LBP continues to be a major disabling condition and one of the four most common diseases worldwide (13). Researchers and clinicians have tried to find ways to further improve treatment effectiveness in individuals suffering from LBP. In this regard, categorization of patients into homogenous subtypes and use of classification-specific treatment have gained increasing popularity over the past decade. As suggested in many studies, identification of homogenous subgroups and classification-based treatment can contribute to improved treatment outcomes in LBP cases (14-22). Despite the increasing development of classification systems, there are arguments which reject the superior outcomes of classification-specific treatment (23-25). Many systematic reviews have attempted to study the effectiveness of physical therapy interventions for subgroups of LBP patients. However, no conclusive evidence suggests that classification-based physical therapy interventions are superior to non-subgrouped physical therapy treatments. One problem of systematic review and meta-analysis studies is the heterogeneity of the included trials. In fact, the conflicting results reported in previous studies, investigating the efficacy of classification-specific treatment in individuals with LBP, are attributed to the heterogeneity of trials (26-28). Nevertheles, it is possible to present more homogenous studies by categorizing trials based on their classification scheme. Today, numerous classification systems have emerged for patients with LBP. Each system classifies LBP cases with regard to different aspects and distinct purposes (29, 30). Overall, movement is the core of physical therapy (31, 32), and the movement system is the focus of physical therapy profession; therefore, movement-based classifications are particularly important in physical therapy. Based on a study by Karayannis et al. (33), five dominant movement-based classifications have been identified, which address physical therapy treatment. These classifications include mechanical diagnosis and treatment (MDT), treatment-based classification (TBC), pathoanatomic-based classification (PBC), movement system impairment (MSI)-based classification, and O’Sullivan classification system (OCS). While a number of systematic reviews (27, 28, 34, 35) have evaluated the effectiveness of classification-based physical therapy for LBP, controversial results in this context are still a problem. Although this problem has been to some extent attributed to heterogeneous trials on the effectiveness of classification-specific physical therapy, the issue of heterogeneity still remains as one of the serious limitations of systematic review studies. Categorization of trials based on their classification systems may somewhat reduce the problem of heterogeneity. In particular, focusing on movement-based classifications may be useful in the field of physical therapy when investigating the effectiveness of treatments. To the best of our knowledge, no research has been so far conducted on the effectiveness of classification-based physical therapy for LBP with the purpose of reducing the heterogeneity of trials through focusing on movement-based classifications. With this background in mind, it seems appropriate to perform a systematic review on the effects of classification-based physical therapy on LBP in comparison to physical therapy without a classification scheme. This systematic review aimed to reduce the heterogeneity of clinical trials, investigating the efficacy of classification-based physical therapy by grouping and reporting studies with main movement-based classification schemes. This is an important issue as grouping of trials based on their classification scheme has not been systematically carried out. Medline, Cochrane, Ovid, Scopus, and PEDro electronic databases were searched systematically to identify relevant studies, using keywords and search terms built around a population, intervention, comparison, outcome (PICO) framework, as shown in Table 1 (36). The literature search was limited to English-written RCTs, published from 1980 to October 3, 2015. Initially, titles and abstracts of potentially relevant trials were checked, and both obviously non-relevant and duplicate articles were eliminated (36). Then, full-text copies of trials, which seemed to be relevant, were retrieved and reviewed. Eventually, relevant articles were selected according to the inclusion and exclusion criteria. 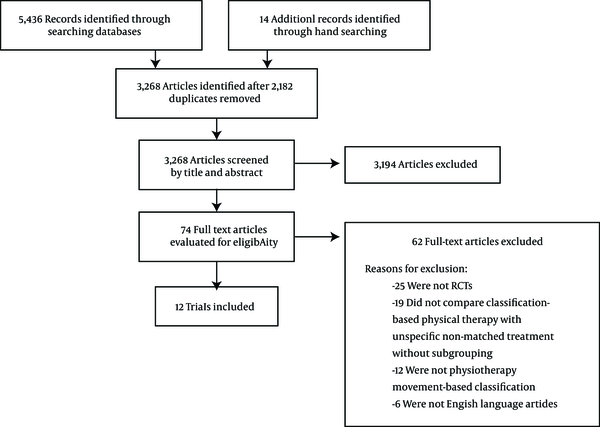 In addition, an extensive hand search of the reference lists of relevant systematic reviews and included articles was performed to identify more studies. Articles were considered eligible if they were RCTs comparing classification-based physical therapy with non-specific, non-matched treatment in patients with LBP. Trials were included if they focused on one or more of five dominant movement-based classification systems (33). RCTs were included if their target population included subjects over 18 years of age with LBP as their primary complaint. There was no limitation on the duration of symptoms. Trials including subjects with primary lower limb impairments, previous spinal surgery, spinal deformity and fracture, systematic inflammatory diseases, pregnancy, ankylosing spondylitis, rheumatoid arthritis, severe neurological deficiencies, spinal malignancy, osteoporosis, and other serious medical conditions were excluded. Two independent assessors evaluated the quality of each trial, using the 10-item PEDro scale, as listed in Figure 1 (37); any disagreement on PEDro scores was resolved through discussion (36). Finally, an expert confirmed the selected articles to ensure the quality of included articles. The PEDro scale is an 11-item scale, designed to assess the methodological quality of RCTs in physical therapy (37). The first item of PEDro scale, which is related to the eligibility of trials and assesses external validity (37), was not considered in scoring the trials in the present review, similar to previous systematic reviews (27, 28, 38). Overall, this scale is a 0 - 10 score measure in which trials with a score of six or higher are considered to have a high quality, while those with a score of five or less are considered as low-quality (23). The scale has been demonstrated to have “fair” to “substantial” reliability (39). It is also a valid measure of the methodological quality of clinical trials (40). 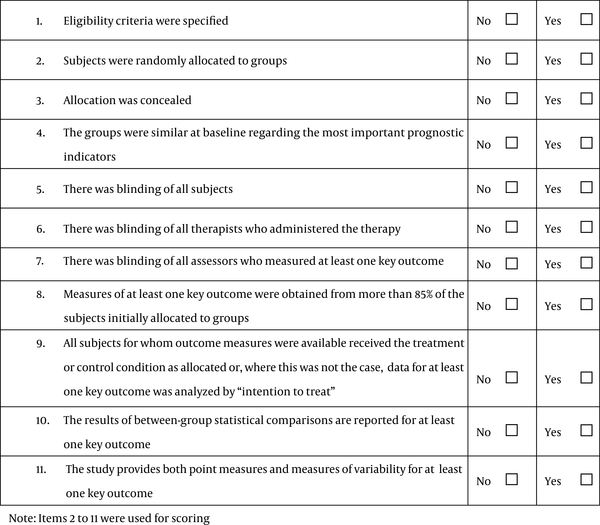 Two reviewers independently extracted the data on the classification scheme, participants’ characteristics, sample size, treatment programs, outcome measures, and inclusion/exclusion criteria to obtain an overview of the included RCTs (36). The sample sizes and standard deviations for each primary outcome were extracted, as well. Data extraction was performed as the reviewer was blinded to the names of the authors, institutions, and journals in order to minimize the risk of bias (36, 41). The Standardized Mean Difference (SMD) is used to calculate the effect size of treatments. Use of SMD allows the comparison of studies with different outcome measures (36, 41). Treatment effects and 95% conﬁdence intervals (CIs) for continuous data were calculated, using Hedges’ adjusted g (SMD) (42). For dichotomous data, relative risk and 95% CIs were calculated (42). Treatment effects favoring classification-specific treatments were assigned positive SMD values. Values of 0.1, 0.2, 0.5, and 0.8 were regarded as trivial, small, moderate, and large effect sizes, respectively (43). In terms of continuous data, the sample size, mean, and standard deviation were recorded for all primary outcomes in the follow-ups for each group (44). If the mean values were not provided, the medians were used to estimate the treatment effects (27, 44). If standard deviations were not reported, the standard errors of mean values were used to calculate the standard deviations (44). - High-quality evidence: At least 75% of RCTs, regardless of the study design, have consistent ﬁndings, direct and precise data, and no known or suspected publication biases. Further research is very unlikely to change our confidence in the estimate of the effect. - Moderate-quality evidence: One of the domains is not met. Further research is likely to have an important impact on our confidence in the estimate of the effect and may change it. - Low-quality evidence: Two of the domains are not met. Further research is very likely to have an important impact on our confidence in the estimate of the effect and is likely to change it. - Very-low-quality evidence: Three of the domains are not met. Any estimate of the effect is very uncertain. A total of 5,436 papers were retrieved through searching Medline, Embase, Cochrane, Ovid, Scopus, and PEDro databases, and 14 papers were found via hand searching. The search strategy, which led to the acquisition of 12 RCTs (15, 18, 20, 23, 47-54), is depicted in Figure 2. The kappa value was 0.65 (P = 0.02), which indicates substantial agreement between the reviewers. Six out of all 12 trials (15, 48, 51-54) scored five or below and were categorized as low-quality studies, using the PEDro scale. The other six trials (18, 20, 23, 47, 49, 50) scored six or higher and were considered as high-quality studies (Table 2). A qualitative analysis was performed using the GRADE system for primary outcome measures. Further details on the GRADE quality assessment of all primary outcome measures are summarized in Appendix 1 in the supplementary file. Key trial characteristics and outcomes are summarized and outlined in Table 3 are described below. Inclusion criteria: Work-related LBP with/without sciatica, duration of pain < 3 wk, and sufficient severity of LBP to necessitate modified work duties. Long et al. (20), CS: MDT, PEDro: 7/10 N = 230 McKenzie treatment matched to the patient's DP including recommendations and unidirectional end-range exs for the lumbar region according to the signs and symptoms (3 - 6 sessions over 2 wk). McKenzie recommendations and unidirectional end-range lumbar exs opposite to the patient's DP (3-6 sessions over 2 wk). Evidence-based care consisting of multidirectional, mid-range lumbar exs, hip and thigh muscle stretching, and some treatment recommendations (3-6 sessions over 2 wk). - Primary outcome measures: Pain (VAS), function (RMDQ), and medication use. - Secondary outcome measures: Activity interference (BDI), pain site, neurological status (QTFQ), patient satisfaction, return to work, and leisure activities. - Short-term follow-up at 2 wk. Inclusion criteria: Age of 18 - 65 y, LBP (acute, subacute, and chronic) with/without leg symptoms, with/without one neurological sign, and presence of directional preference. Inclusion criteria: Age of 18-65 y, primary complaint of LBP, with/without extension into the lower extremity, pain duration (acute/subacute) < 90 d, and an OSW score of ≥ 25%. Browder et al. (47), CS: TBC, PEDro: 6/10 N = 48 Ext-oriented treatment approach: An exs program and mobilization techniques to centralize the symptoms. Exs included repeated lumbar ext in the prone position progressing to the standing position and repeated end-range ext exs (three sets of 10 repetitions with holding each repetition 2-3 s at end-range). Mobilization treatment including posterior-anterior lumbar mobilization (10 to 20 repetitions). Home exs, including one set of 10 repetitions every 2 to 3 walking hours (Six sessions over 4 wk). A strengthening program with the aim of increasing isolated muscle contraction of deep abdominal muscles and increasing the muscle strength of primary lumbar stabilizers (six sessions for 4 wk) - Primary outcome measures: Function (OSW) and pain (NPRS). - Secondary outcome measures: Fear-avoidance beliefs (FABQ). - Short and intermediate follow-ups (1 wk, 4 wk, and 6 mo). Inclusion criteria: Age of 18-60 y, LBP and symptoms of any duration, pain extended distal to the buttocks in at least one lower extremity, presence of the centralization phenomenon, and modified OSW score ≥ 30%. Hoffman et al. (18), CS: MSI, PEDro: 6/10 N = 36 MSI classification-based treatment: Enhancement of patients' knowledge regarding their specific LBP classification and painful positions/movement directions in order to minimize faulty postures and movements in daily activities and prescription of specific exs to minimize painful postures and movement directions in the lumbopelvic region during daily activities (6 sessions weekly over 6 wk). Non-specific treatment including patient knowledge enhancement of the spine, neutral spinal alignment, and LBP, as well as patient education regarding the maintenance of neutral spinal alignment during painful daily activities (6 sessions weekly over 6 wk). - Kinematics of prone medial and lateral hip rot. - Short-term follow-up (1 wk). Inclusion criteria: Age of 18 - 60 y, LBP (chronic) for ≥ 12 mo, and no acute flare-up. Petersen et al. (50), CS: MDT, PEDro: 6/10 N = 259 McKenzie treatment program: - Recommendations for back self-care provided in an educational booklet. - Instructions on proper back care and maintenance of physical activity. Vertebral mobilization techniques including manipulation thrusts were not applied (max of 15 sessions over 12 wk). If necessary, a home-based strengthening and stabilization exc program was applied at the end of the clinical treatment for a duration of 2 mo. Spinal manipulation involving manual therapy techniques, such as mobilization and manipulation of the spine, massage of myofascial trigger points, stretching techniques, and lumbar flex and ext movement exs. Specific exs in the DP of patients were prevented. Guide to proper back care and maintaining physical activity was presented (max of 15 sessions over 12 wk). If necessary, 2 mo of home strengthening and stabilization exs were recommended at the end of the clinical treatment period. - Primary outcome measure: Proportion of patients reporting success at 2-mo follow-up on the modiﬁed RMDQ. - Secondary outcome measures: Success at 6 mo and 1 y follow-ups on the RMDQ, pain control (back and leg pain questionnaire), GPE, quality of life (SF-36), days with reduced activity, return to work, satisfaction with treatment, and use of health care after the completion of treatment. - Short-, intermediate-, and long-term follow-ups (after treatment and at 6 mo and 1-y). Inclusion criteria: Age of 18-60 y, non-specific LBP (acute and subacute) > 6 wk with/without leg pain, and presence of disc-related symptoms with centralization/peripheralization of symptoms (presence of directional preferences). Apeldoorn et al. (23), CS: Modified, TBC PEDro: 7/10 N = 156 Direction-specific exs: Exs matched to specific DPs of the patient. Manipulation: Manipulation thrusts for lumbar and/or SI joints. Stability: Maintenance of spinal stability during trunk and limb movements in different positions and functional activities. Specific treatment lasted for a min over 4 wk. Afterwards, treatment changed to current Dutch LBP guidelines. A usual physical therapy intervention consisting of individual treatments, based on the clinical presentation of the patient. The most common techniques were muscle strengthening, mobilization and manipulation, stabilization exs, massage therapy, and cognitive therapy. - Primary outcome measures: Pain (NPRS), function (OSW), and GPE. - Secondary outcome measures: Fear-avoidance beliefs (FABQ), Orebro Musculoskeletal Pain Questionnaire, and health status questionnaire (SF-36). - Short-, intermediate-, and long-term follow-ups (8, 26, and 52 wk after the start of treatment). Inclusion criteria: LBP with/ without the associated leg pain, age of 18 - 65 y, and current episode duration (subacute and chronic) > 6 wk. Vibe Fersum et al. (54), CS: OCS, PEDro: 5/10 N = 121 Classification-based cognitive functional therapy consisting of four main components: - Patient's cognitive awareness regarding the viscous cycle of pain and how to break it. - Specific exs to change old provocative motor behaviors in order to normalize movement behaviors guided by LBP classifications. - A function-integrated exs program along with correcting movement behaviors in provocative tasks of daily life. - Patient's preference of physical exs according to the LBP classification. The ﬁrst 2-3 sessions were held weekly, followed by one session every 2–3 wk over 12 wk. Manual therapy and exs involving joint mobilization/manipulation techniques for the spine/pelvis. General exs at home or clinic or motor control exs (treatment duration of 12 wk). - Primary outcome measures: Function (OSW) and pain (NPRS). - Secondary outcome measures: Anxiety and depression (Hopkins Symptoms Checklist), fear-avoidance beliefs questionnaire (FABQ), lumbar ROM, patient satisfaction, sick-leave days, and care seeking. - Short- and long-term follow-ups (after treatment and 1 y follow-up). Inclusion criteria: Age of 18-65 y, non-specific LBP (chronic) > 3 mo, primarily localized from T12 to gluteal folds, NPRS > 2/10 over the past 14 d, OSW score > 14%, and pain aggravation and relief with postures, movements, and activities. Sheeran et al. (53), CS: OCS, PEDro: 5/10 N = 58 Classification-specific postural intervention: Postural training in accordance with LBP classification of the patients. Education of patients with a flex pattern to maintain lumbar relative ext and patients with an active ext pattern to maintain relative lumbar flex (30-min intervention with a total of 120 repetitions in standing and sitting positions). Four weeks of home exs over 15 min with a total of 60 repetitions in standing and sitting positions three times a day. General postural intervention instructing all patients to maintain the mid-position of lumbar spine between full flex and full ext positions (30-min intervention with a total of 120 repetitions in standing and sitting positions and 4 wk of home exs over 15 min with a total of 60 repetitions in standing and sitting positions three times a day). - Primary outcome measure: Function (RMDQ) at 4 wk. - Secondary outcome measures: Pain (VAS), spinal repositioning sense, and trunk muscle activity during sitting and standing positions. - Short-term follow-up (after one-to-one intervention and at 4 wk follow-up). Inclusion criteria: Non-specific LBP (chronic) for > 12 wk and mechanical LBP in the lumbar and buttock regions. Henry et al. (49), CS: TBC- MSI, PEDro: 7/10 N = 124 - Ineligibles for stabilization exs received MSI treatment matched to the subgroup, including education and exs to correct movement patterns/postures and modify daily activities. - Eligibles for stabilization exs received exs involving repeated submaximal strengthening of trunk muscles to improve the control and stability of the trunk. - Eligibles for stabilization exs received matched MSI treatment involving education and exs to correct the movement patterns/postures and also modify daily activities (one session weekly for 6 wk and daily home exs). Ineligibles for stabilization exs received unmatched treatment, including repeated submaximal strengthening of trunk muscles (one session weekly for 6 wk and daily home exs). - Primary outcome measures: Function (OSW) and pain (NPRS). - Secondary outcome measures: Function (GCPS-DS), pain (GPCS- CPI), fear-avoidance beliefs (FABQ), and health status questionnaire (SF-36). - Intermediate- and long-term follow-ups (7 wk and 1y). Inclusion criteria: Age of 21 - 55 y, LBP (chronic) ≥ 12 mo with/without recurrences, modified OSW score ≥ 19% and/or a score of < 8 in at least one activity from PSFS, and current employment or active engagement in daily activities. Saner et al. (51), CS: OCS, PEDro: 5/10 N = 106 Movement control exs for specific subgroups consisting of active exs including pain-provoking postures and control over impaired movements. Special attention was paid to functional restoration of impaired movements (9-12 wk of clinic exs twice a wk for a duration of 30 min). Home exs program was applied at least twice a wk for up to 1 y after treatment. General exs treatment to strengthen the lumbopelvic region and leg muscles (9-12 wk of clinic exs twice a wk for a duration of 30 min). A home exercise program was applied for at least twice a wk for up to 1 y after treatment. - Primary outcome measure: Function (PSFS). - Secondary outcome measures: Pain (GCPS) and function (GCPS and RMDQ). - Intermediate- and long-term follow-ups (after treatment and at 6 mo and 1 y). Inclusion criteria: Age of 18-75 yrs, non-specific LBP, duration of LBP (subacute and chronic) > 6 wk, no radiating symptoms below the knee, RMDQ ≥ 5, and history of movement control complaints along with at least two positive tests out of six MCI tests. Inclusion criteria: Age of 18-75 yrs, non-specific LBP (subacute and chronic) > 6 wk, RMDQ ≥ 5, and at least two positive tests out of six MCI tests. Abbreviations: BDI, Beck Depression Inventory; CI, Control Impairment; CS, Classification scheme; d, day; DP, Directional preference; ECI, Extension Control Impairment; EMI, Extension Movement Impairment; Exs, Exercise; Ext, Extension; FABQ, Fear-Avoidance Beliefs Questionnaire; FCI, Flexion Control Impairment; Flex, Flexion; FMI, Flexion Movement Impairment; GPE, Global Perceived Effect; GCPS-DS, Graded Chronic Pain Scale-Disability Scale; GCPS-CPI, Graded Chronic Pain Scale-Characteristic Pain Index; LBP, Low back pain; max, maximum; min, minute; MDT, Mechanical and Diagnosis Treatment; mo, month; MSI, Movement System Impairment; NPRS, Numerical Pain Rating Scale; OSC, O’Sullivan Classification Scheme; OSW, Oswestry Disability Questionnaire; PEDro, PEDro scale score; PSFS, Patient-Specific Functional Scale; ROM, Range of motion; QTFQ, Quebec Task Force Questionnaire; RMDQ, Roland-Morris Disability Questionnaire; Rot, Rotation; s, second; SF-36, 36-Item Short-Form Health Survey; SI, Sacroiliac; TBC, Treatment-Based Classification; VAS, Visual Analog Scale; wk, week; y, year. According to our literature review, two trials (20, 50) focused on MDT. One trial (20) (N = 230, PEDro: 7/10), which studied acute, subacute, and chronic LBP, evaluated function and pain as the primary outcome measures at short-term follow-up. They showed that MDT-matched treatment significantly improved all primary and secondary outcomes, compared to the evidence-based approach. Large effect sizes were reported for back pain alleviation (SMD: 0.8, 95% CI: 0.3 - 1.2), moderate effect sizes for leg pain relief (SMD: 0.7, 95% CI: 0.3 - 1.2) and function improvement (SMD: 0.5, 95% CI: 0.0 - 1.0), and small effect sizes for medication use reduction (SMD: 0.4, 95% CI: 0.0 - 1.0) in favor of matched treatment at short-term follow-up. Another trial (50) (N = 259, PEDro: 6/10), which studied acute and subacute LBP, showed that MDT intervention, along with recommendations on back care, was slightly more effective than manipulation treatment in cases with LBP (experiencing more than six weeks of pain) at all short, intermediate, and long-term follow-ups. There was a statistically significant difference in primary outcome measures, including the patient proportion with successful function (Roland Morris disability questionnaire; RMDQ), which was higher in the MDT intervention group at two-month follow-up. In addition, a statistically significant difference was observed in most secondary outcome measures. A small effect size was reported for the patient population reporting success on RMDQ as the primary outcome measure (SMD: 0.3, 95% CI: 0.0 - 0.5) at short-term follow-up, thus indicating the superiority of MDT over manipulation. To sum up, moderate-quality evidence has been reported in one trial (imprecision), indicating that matched MDT-based treatment is more effective than non-matched evidence-based care for patients with LBP at short-term follow-ups. Further research is likely to have an important impact on our confidence in the estimate of the effect and may change it. Also, moderate-quality evidence reported in one trial (imprecision) suggests that MDT-based treatment, matched to patient subgroups, is more effective than manipulation treatment non-matched to LBP subtypes at intermediate-term follow-ups. Further research is likely to have an important impact on our confidence in the estimate of the effect and may change it. Four trials (51-54) focused on the OSC scheme. One trial (54) (N = 121, PEDro: 5/10) compared classification-based cognitive functional therapy with traditional manual therapy and exercise in chronic cases of LBP at short- and long-term follow-ups; pain and function were the primary outcome measures. They found statistically and clinically significant differences in favor of classification-based treatment in terms of all outcomes in both post-treatment and 12-month follow-ups. In these studies, large effect sizes were evident for function improvement at short-term (SMD: 1.4, 95% CI: 1.0 - 1.9) and long-term (SMD: 0.9, 95% CI: 0.4 - 1.3) follow-ups, favoring classification-based treatment. Large effect sizes were reported for pain alleviation at short-term follow-up (SMD: 1.1, 95% CI: 0.7 - 1.6), while moderate effect sizes were observed at long-term follow-up (SMD: 0.7, 95% CI: 0.2 - 1.1) in favor of classification-based treatment. Another trial (53) (N = 58, PEDro: 5/10) attempted to compare classification-specific postural intervention with general postural intervention at short-term follow-up. This study showed significant statistical and clinical differences in function as a primary outcome measure, as well as most secondary outcome measures after four weeks of home exercise in patients with non-specific LBP. Large effect sizes were reported for function improvement at short-term follow-up (SMD: 1.0, 95% CI: 0.4 - 1.6), indicating the superiority of classification-specific postural intervention over general postural intervention. In addition, a trial (52) (N = 106, PEDro: 5/10) investigated the short-term results of a tailored specific exercise program in comparison with a general exercise program in cases with sub-acute or chronic LBP and impaired movement control. Neither of treatment approaches resulted in a significant difference in the recovery measured by function (patient-specific functional scale; PSFS) as the primary outcome. A small effect size was reported for function improvement at short-term follow-up (SMD: 0.3, 95% CI: 0.0 - 0.7) in favor of movement control over general exercise. In another study (51) (N = 106, PEDro: 5/10), tailored specific exercise was compared with a general exercise program in non-specific LBP patients with impaired movement control at short-, intermediate-, and long-term follow-ups. They found no statistically significant inter-group difference in functional improvement (PSFS) as the primary outcome or any of the secondary outcome measures. A negative effect size was found for functional improvement at short-term follow-up (SMD: -0.1, 95% CI: -0.5 - 0.2), and no effect was observed at intermediate (SMD: 0.0, 95% CI: -0.4 - 0.3) and long-term (SMD: 0.0, 95% CI: -0.4 - 0.3) follow-ups in favor of tailored specific exercise versus general exercise. To sum up, there is low-quality evidence from two trials (indirectness due to clinical heterogeneity, limitation imposed by high risk of bias), indicating that OSC-based classification-specific treatment is more effective than other treatment programs without a classification scheme for chronic LBP cases at short-term follow-up. Further research is highly likely to have an important impact on our confidence in the estimate of the effect and is likely to change it. One trial reported statistically significant differences in the outcomes in favor of OSC-based classification-specific treatment at long-term follow-up. There is moderate-quality evidence from two trials (limitation due to the high risk of bias), indicating no statistically significant difference in function (PSFS) as a primary outcome measure at short-term follow-up between subacute and chronic LBP cases who received OSC-based movement control exercises and general exercise treatment. Further research is likely to have an important impact on our confidence in the estimate of the effect and may change it. Also, long-term follow-up was conducted in one trial and showed no statistically significant difference in any of the follow-ups. Overall, five trials (15, 23, 47-49) focused on the TBC scheme. One trial (48) (N = 78, PEDro: 5/10) targeting acute LBP compared TBC-specific treatment with clinical practice guidelines. After four weeks, most outcome measures showed statistically significant inter-group differences in favor of TBC approach, although there was no statistically significant difference after a one-year follow-up. Moderate effect sizes were reported for mental health improvement (SMD: 0.7, 95% CI: 0.2 - 1.1), function improvement (SMD: 0.5, 95% CI: 0.0 - 1.0), physical health progress (SMD: 0.5, 95% CI: 0.0 - 1.0), physical impairment reduction (SMD: 0.4, 95% CI: -0.4 - 1.4), and return to work (SMD: 0.6, 95% CI: 0.1 - 1.2), while no effect on patient satisfaction (SMD: 0.0, 95% CI: -0.6 - 0.4) was reported at short-term follow-up in favor of TBC-based classification-specific treatment. In the mentioned study, small effect sizes were reported for improving mental health (SMD: 0.3, 95% CI: -0.1 - 0.8) and physical health status (SMD: 0.2, 95% CI: -0.1 - 0.7), while trivial effect sizes were found for functional improvement (SMD: 0.1, 95% CI: -0.3 - 0.5) at long-term follow-up, favoring TBC-based classification-specific treatment. Another trial (15) (N = 123, PEDro: 5/10) investigated modified TBC-based matched treatment versus TBC-based non-matched intervention in patients with acute and subacute LBP, using function as the only outcome measure. This study showed that matched treatment could lead to a statistically significant functional improvement (Oswestry Disability Index; OSW) at short-term and one-year follow-ups. A small effect size was evident for functional improvement at short-term follow-up (SMD: 0.3, 95% CI: 0.0 - 0.6), and a trivial effect size was observed at long-term follow-up (SMD: 0.1, 95% CI: -0.2 - 0.6), favoring matched treatment. Another trial (47) (N = 48, PEDro: 6/10) compared an extension-specific exercise program with abdominal strengthening exercises in a population suggested to beneﬁt from an extension-oriented treatment approach; pain and function were considered as the primary outcome measures. The results showed that function (OSW) significantly changed at short- and intermediate-term follow-ups in favor of the extension-oriented treatment approach. Pain (numeric pain rating scale; NPRS) showed a significant difference within only one week, but not at longer follow-ups. In the above-mentioned study, small effect sizes were found at short-term follow-ups for pain reduction within one week (SMD: 0.4, 95% CI: -0.2 - 1.0) and four weeks (SMD: 0.3, 95% CI: -0.3 - 0.9), as well as function improvement at one week (SMD: 0.3, 95% CI: -0.3 - 0.8). Also, a moderate effect size was reported for function improvement at four-week follow-up (SMD: 0.6, 95% CI: 0.1 - 1.2) in favor of extension-specific exercises. A moderate effect size was evident for function improvement at intermediate-term follow-up (SMD: 0.7, 95% CI: 0.1 - 1.3), favoring extension-specific exercises. Additionally, a small effect size was reported for pain alleviation at intermediate-term follow-up (SMD: 0.2, 95% CI: -0.3 - 0.8), favoring extension-specific exercises. Another trial (23) (N = 156, PEDro: 7/10) attempted to compare modified TBC with usual physical therapy in subacute and chronic LBP patients. They found no significant inter-group differences in primary outcome measures including pain, function, and global perceived effect (GPE) or secondary outcomes at any of the short, intermediate, or long-term follow-ups. Negative effect sizes were reported for function (SMD: -0.2, 95% CI: -0.5 - 0.1) and pain (SMD: -0.3, 95% CI: -0.7 - 0.0) and a zero effect size for GPE (SMD: 0.0, 95% CI: -0.3 - 0.3) at short-term follow-up in favor of TBC-based intervention. In the discussed study, there were small effect sizes for function improvement (SMD: 0.2, 95% CI: -0.2 - 0.6), zero effect for pain alleviation (SMD: 0.0, 95% CI: -0.4 - 0.4), and negative effect size for GPE (SMD: -0.2, 95% CI: -0.6 - 0.1) at intermediate-term follow-up. Long-term effect size was zero for pain alleviation (SMD: 0.0, 95% CI: -0.3 - 0.5), small for function improvement (SMD: 0.3, 95% CI: 0.0 - 0.8), and moderate for GPE (SMD: 0.5, 95% CI: 0.1 - 0.9) in favor of TBC-based intervention. In a recent trial (49) (N = 124, PEDro: 7/10), the TBC scheme was used jointly with the MSI approach. The researchers observed no further improvement in classification-matched treatment in comparison with classification-unmatched treatment, using pain and function as the primary outcome measures. Further details are provided in the section, “trials applying movement system impairment”. Negative effect sizes were found for functional improvement (SMD: -0.3, 95% CI: -0.8 - 0.1) and pain alleviation (SMD: -0.1, 95% CI: -0.5 - 0.3) at intermediate-term follow-up. At long-term follow-up, a negative effect size was found for pain alleviation (SMD: -0.2, 95% CI: -0.7 - 0.1) and zero effect size for function improvement (SMD: 0.0, 95% CI: -0.5 - 0.3) in classification-specific treatment versus non-specific treatment. To sum up, there is low-quality evidence from three trials (indirectness due to clinical heterogeneity and limitations due to the high risk of bias), indicating that TBC-based specific treatment is more effective in improving short-term outcomes than non-specific treatment. Further research is very likely to have an important impact on our confidence in the estimate of the effect and is likely to change it. In a previous trial, an intermediate-term follow-up was performed and a significant difference was observed in favor of TBC. Two other trials collected data at long-term follow-ups, as well. However, one supported the persistence of the benefits of TBC at long-term follow-up, while the other did not. Moderate-quality evidence from these two trials (indirectness due to the simultaneous use of MSI scheme with TBC and clinical heterogeneity) indicates no statistically significant difference at any of the follow-ups for primary outcome measures between LBP cases who received TBC-based specific treatment and those who received non-matched treatment. Further research is likely to have an important impact on our confidence in the estimate of the effect and may change it. According to our literature review, two trials (18, 49) focused on the MSI scheme. One trial (18) (N = 36, PEDro: 6/10) compared MSI-based classification-specific treatment with a common non-specific therapy in chronic LBP cases at short-term follow-up. A statistically significant decline in lumbopelvic rotation and the amount of hip rotation before the start of pelvic movement was detected in the specific approach, which indicates the improvement of movement pattern following treatment. Large effect sizes were reported for all outcome measures including lumbopelvic range of motion (ROM) during lateral hip rotation (SMD: 1.6, 95% CI: 0.7 - 2.4), lumbopelvic ROM during medial hip rotation (SMD: 1.6, 95% CI: 0.8 - 2.5), lateral hip rotation ROM (SMD: 0.9, 95% CI: 0.1 - 1.6), lateral hip rotation completed before the onset of lumbopelvic rotation (SMD: 0.9, 95% CI: 0.1 - 1.6), and medial hip rotation completed before the onset of lumbopelvic rotation (SMD: 1.2, 95% CI: 0.4 - 2.0), favoring MSI-based classification-specific treatment. In addition, another trial (49) (N = 124, PEDro: 7/10) compared classification-matched intervention with classification-unmatched intervention, based on both MSI and TBC schemes in chronic LBP patients. There was not a statistically significant inter-group difference in pain and disability scores as the primary outcome measures after seven-week and one-year follow-ups. Negative effect sizes were reported for functional improvement (SMD: -0.3, 95% CI: -0.8 - 0.1) and pain relief (SMD: -0.1, 95% CI: -0.5 - 0.3) at intermediate-term follow-up. At long-term follow-up, a negative effect size was found for pain reduction (SMD: -0.2, 95% CI: -0.7 - 0.1), and zero effect size was observed for function improvement (SMD: 0.0, 95% CI: -0.5 - 0.3) in favor of classification-specific treatment versus non-specific treatment. To sum up, moderate-quality evidence from one trial (imprecision) indicates that MSI-based, classification-specific treatment is more effective than non-specific treatment for chronic LBP cases at short-term follow-up. Further research is likely to have an important impact on our confidence in the estimate of the effect and may change it. Low-quality evidence from one trial (indirectness due to the simultaneous use of TBC scheme with MSI, imprecision) suggests no statistically significant difference at intermediate and long-term follow-ups for pain and function as the primary outcome measures between chronic LBP cases who received matched treatment based on MSI and TBC schemes and those who received unmatched intervention. Further research is likely to have an important impact on our confidence in the estimate of the effect and is likely to change it. In this systematic review, we focused on movement-based classification systems to investigate the effectiveness of classification-specific physical therapy. We tried to reduce the heterogeneity of the included trials by grouping studies based on the applied classification system. It was not possible to perform a meta-analysis due to clinical heterogeneity of the included trials. Despite the differences in study design, two high-quality trials supported the superiority of classification-specific treatment. However, long-term effects of treatment were evaluated in only one study, and further evidence is required to confirm the durability of treatment effects. The effectiveness of treatment targeted to subgroups using MDT has been supported in most previous systematic reviews (55, 56). These studies have suggested short-term effects for MDT treatment, as shown in the present study. Our findings in this systematic review are consistent with previous studies. Among four studies focusing on OSC (51-54), three trials (51, 52, 54) were similar in terms of most characteristics. However, two studies by Saner et al. (51, 52) were in conflict with the study by Vibe Fersum et al. (54). In the study by Vibe Fersum et al. (54), further improvements in the classification-based approach might be attributed to the strong emphasis on the cognitive aspects of multidimensional treatment for chronic non-specific LBP cases with special attention to patients’ LBP awareness and the related signs and symptoms. Given the fact that the mechanism of chronic LBP is behavioral and cognitive rather than sensory and biomechanical (57), the greater emphasis of the study by Vibe Fersum et al. (54) on the cognitive aspects of treatment might have contributed to the superior outcomes in classification-based intervention. In addition, giving particular importance to patient awareness and active participation in cognitive and behavioral therapy may provide continuous treatment for patients in all aspects of life and can be a reason for greater improvements observed in the classification-based treatment in this study. Moreover, Vibe Fersum et al. (54) used OSW to measure function as the primary outcome measure, whereas Saner et al. (51, 52) used PSFS. However, the OSW questionnaire was reported to be more responsive than PSFS in cases with subacute or chronic LBP and mild disability (58). The trial by Sheeran et al. (53) confirmed the superiority of classification-based treatment, although their study specifically targeted postural training intervention for chronic LBP patients. Overall, further studies are needed to obtain more information in this context. According to the GRADE approach, which assesses the quality of evidence, further high-quality trials are recommended to reveal the effectiveness of classification-specific treatment, using the OSC scheme. To the best of our knowledge, no previous systematic review has critically appraised clinical trials, focusing on OSC scheme to determine the efficacy of OSC in the treatment of LBP. The conflicting results in trials investigating the efficacy of TBC scheme may be attributed to differences in the study designs; the main difference is the study population characteristics. Three trials (15, 47, 48) included subjects in the acute stage of LBP, while two trials (23, 49) evaluated participants with chronic LBP. Interestingly, trials investigating acute LBP patients reported improvements in matched treatment in comparison with non-matched treatment. However, trials including more chronic participants did not observe any superiority for the matched treatment program. This can be explained by the fact that TBC scheme is designed primarily to examine acute LBP patients, and the treatment approach is specifically applied for cases of acute-stage LBP (59). In addition, chronic pain is a complex phenomenon and a multi-mechanism disorder, which cannot be strictly attributed to the physical dimension (60-64). However, it can be considered a complex interactive system, consisting of multiple elements including physical, neuromuscular, psychosocial, cognitive, and behavioral components and the interaction of elements influencing LBP (60, 65). Two trials which included chronic LBP patients did not consider multiple elements of chronic LBP in the classification-based treatment program. There is also controversy over the persistence of the superiority of classification-specific treatment at long-term follow-up between trials conducted by Fritz et al. (48) and Brennan et al. (15). This may be due to the fact that the sample size in the study by Fritz and colleagues was not large enough to provide sufficient power for exhibiting the long-term effects. Considering the GRADE system of evidence quality, further studies are recommended in order to estimate the effects of TBC scheme in people with LBP. Evidence on the efficacy of TBC scheme has been conflicting. This is in consistence with previous reviews investigating the efficacy of TBC in LBP cases. While some reviews have recommended TBC as an approach for more effective interventions, others have not. The results of a study by Kent et al. noted that TBC-based treatment targeted to subgroups may improve the outcomes, although more extensive research is required (66). Another review study noted that appropriate management of LBP via TBC reduces pain and disability in athletes (55). Overall, further homogeneous studies can provide higher quality evidence and more explicit conclusions on the effects of treatment. The two trials focusing on the MSI scheme (18, 49) are almost similar. The contradictory results may be attributed to differences in the outcome measures. Actually, chronic LBP is a problem, consisting of more than one dimension. Hence, it is ideal for researchers to consider multiple aspects of chronic LBP while assessing the outcomes of treatment (67-69). Hoffman et al. (18) confined the evaluation of treatment success to the improvement of physical impairments, whereas Henry et al. (49) used pain, function, fear-avoidance beliefs, and health status to evaluate the treatment outcomes. Researchers have been recommended to consider more comprehensive outcomes to further reveal the treatment effects (67, 70). Furthermore, in a study by Hoffman et al. (18), medial and lateral hip rotations in the prone position were used as the treatment and also outcome measures. This could be a reason for the emergence of positive effects in the classification-specific treatment. In addition, different follow-up time points in the conducted studies may be another reason for the contradictory results. Conflicting evidence was reported by two trials comparing MSI-based, classification-specific treatment with non-matched treatment, disregarding the specific characteristics of subgroups. Overall, further homogeneous studies are needed to reach a more accurate conclusion on this scheme. It should be noted that there are no previous systematic reviews investigating the effectiveness of MSI-based classification treatment. One limitation of this study was the heterogeneity of trials, due to which it was not possible to conduct a meta-analysis; however, a qualitative GRADE analysis was performed. We could provide more homogeneous information by investigating the trials in four categories, based on their classification scheme. Another study limitation was the exclusion of non-English language trials. In fact, it is not clear whether or not the language limitation is associated with bias in this review. The major strengths of this study include the novel topical research question, use of best-practice systematic review methods including PICO, PEDro, PRISMA, and GRADE, extensive literature search, and use of two independent raters. Overall, grouping of trials based on the classification system in the present study provides more homogenous information to investigate the efficacy of classification-specific physical therapy in LBP cases. In addition, it could resolve some controversies in studies investigating the effectiveness of classification-specific physical therapy and provided possible explanations for these controversies. To come to a stronger conclusion about the effectiveness of classification-based specific physical therapy, further high-quality RCTs with more homogenous designs are needed. The present study was performed by the general support of Iran University of Medical Sciences, Tehran, Iran. 1. Kent PM, Keating JL. The epidemiology of low back pain in primary care. Chiropr Osteopat. 2005;13:13. doi: 10.1186/1746-1340-13-13. [PubMed: 16045795]. 2. Steenstra IA, Verbeek JH, Heymans MW, Bongers PM. Prognostic factors for duration of sick leave in patients sick listed with acute low back pain: a systematic review of the literature. Occup Environ Med. 2005;62(12):851-60. doi: 10.1136/oem.2004.015842. [PubMed: 16299094]. 3. Thelin A, Holmberg S, Thelin N. Functioning in neck and low back pain from a 12-year perspective: a prospective population-based study. J Rehabil Med. 2008;40(7):555-61. doi: 10.2340/16501977-0205. [PubMed: 18758673]. 4. Stubbs B, Koyanagi A, Thompson T, Veronese N, Carvalho AF, Solomi M, et al. The epidemiology of back pain and its relationship with depression, psychosis, anxiety, sleep disturbances, and stress sensitivity: Data from 43 low- and middle-income countries. Gen Hosp Psychiatry. 2016;43:63-70. doi: 10.1016/j.genhosppsych.2016.09.008. [PubMed: 27796261]. 5. Dagenais S, Caro J, Haldeman S. A systematic review of low back pain cost of illness studies in the United States and internationally. Spine J. 2008;8(1):8-20. doi: 10.1016/j.spinee.2007.10.005. [PubMed: 18164449]. 6. Katz JN. Lumbar disc disorders and low-back pain: socioeconomic factors and consequences. J Bone Joint Surg Am. 2006;88 Suppl 2:21-4. doi: 10.2106/JBJS.E.01273. [PubMed: 16595438]. 7. Steel N. Global, regional, and national incidence, prevalence, and years lived with disability for 310 diseases and injuries, 1990–2015: a systematic analysis for the Global Burden of Disease Study 2015. Lancet. 2016;388(10053):1545-602. doi: 10.1016/s0140-6736(16)31678-6. 8. Lin CC, Li Q, Williams CM, Maher CG, Day RO, Hancock MJ, et al. The economic burden of guideline-recommended first line care for acute low back pain. Eur Spine J. 2016. doi: 10.1007/s00586-016-4781-0. [PubMed: 27652679]. 9. Yang H, Haldeman S, Lu ML, Baker D. Low Back Pain Prevalence and Related Workplace Psychosocial Risk Factors: A Study Using Data From the 2010 National Health Interview Survey. J Manipulative Physiol Ther. 2016;39(7):459-72. doi: 10.1016/j.jmpt.2016.07.004. [PubMed: 27568831]. 10. Freburger JK, Holmes GM, Agans RP, Jackman AM, Darter JD, Wallace AS, et al. The rising prevalence of chronic low back pain. Arch Intern Med. 2009;169(3):251-8. doi: 10.1001/archinternmed.2008.543. [PubMed: 19204216]. 11. Hestbaek L, Leboeuf-Yde C, Manniche C. Low back pain: what is the long-term course? A review of studies of general patient populations. Eur Spine J. 2003;12(2):149-65. 12. Pengel LH, Herbert RD, Maher CG, Refshauge KM. Acute low back pain: systematic review of its prognosis. BMJ. 2003;327(7410):323. doi: 10.1136/bmj.327.7410.323. [PubMed: 12907487]. 13. Vos T, Flaxman AD, Naghavi M, Lozano R, Michaud C, Ezzati M, et al. Years lived with disability (YLDs) for 1160 sequelae of 289 diseases and injuries 1990-2010: a systematic analysis for the Global Burden of Disease Study 2010. Lancet. 2012;380(9859):2163-96. doi: 10.1016/S0140-6736(12)61729-2. [PubMed: 23245607]. 14. Borkan JM, Koes B, Reis S, Cherkin DC. A report from the Second International Forum for Primary Care Research on Low Back Pain. Reexamining priorities. Spine (Phila Pa 1976). 1998;23(18):1992-6. [PubMed: 9779533]. 15. Brennan GP, Fritz JM, Hunter SJ, Thackeray A, Delitto A, Erhard RE. Identifying subgroups of patients with acute/subacute "nonspecific" low back pain: results of a randomized clinical trial. Spine (Phila Pa 1976). 2006;31(6):623-31. doi: 10.1097/01.brs.0000202807.72292.a8. [PubMed: 16540864]. 16. Childs JD, Fritz JM, Flynn TW, Irrgang JJ, Johnson KK, Majkowski GR, et al. A clinical prediction rule to identify patients with low back pain most likely to benefit from spinal manipulation: a validation study. Ann Intern Med. 2004;141(12):920-8. [PubMed: 15611489]. 17. Halliday MH, Ferreira PH, Hancock MJ, Clare HA. A randomized controlled trial comparing McKenzie therapy and motor control exercises on the recruitment of trunk muscles in people with chronic low back pain: a trial protocol. Physiotherapy. 2015;101(2):232-8. doi: 10.1016/j.physio.2014.07.001. [PubMed: 25442673]. 18. Hoffman SL, Johnson MB, Zou D, Harris-Hayes M, Van Dillen LR. Effect of classification-specific treatment on lumbopelvic motion during hip rotation in people with low back pain. Man Ther. 2011;16(4):344-50. doi: 10.1016/j.math.2010.12.007. [PubMed: 21256073]. 19. Huijnen IP, Rusu AC, Scholich S, Meloto CB, Diatchenko L. Subgrouping of low back pain patients for targeting treatments: evidence from genetic, psychological, and activity-related behavioral approaches. Clin J Pain. 2015;31(2):123-32. doi: 10.1097/AJP.0000000000000100. [PubMed: 24681821]. 20. Long A, Donelson R, Fung T. Does it matter which exercise? A randomized control trial of exercise for low back pain. Spine (Phila Pa 1976). 2004;29(23):2593-602. [PubMed: 15564907]. 21. Hodges PW, van Dieen JH, Cholewicki J. Introduction:convergence and divergence of opinions on spinal control. Churchill Livingstone; 2013. doi: 10.1016/b978-0-7020-4356-7.00001-x. 22. Licciardone JC, Gatchel RJ, Aryal S. Targeting Patient Subgroups With Chronic Low Back Pain for Osteopathic Manipulative Treatment: Responder Analyses From a Randomized Controlled Trial. J Am Osteopath Assoc. 2016;116(3):156-68. doi: 10.7556/jaoa.2016.032. [PubMed: 26927909]. 23. Apeldoorn AT, Ostelo RW, van Helvoirt H, Fritz JM, Knol DL, van Tulder MW, et al. A randomized controlled trial on the effectiveness of a classification-based system for subacute and chronic low back pain. Spine (Phila Pa 1976). 2012;37(16):1347-56. doi: 10.1097/BRS.0b013e31824d9f2b. [PubMed: 22333955]. 24. Kent P, Keating JL. Classification in nonspecific low back pain: what methods do primary care clinicians currently use? Spine (Phila Pa 1976). 2005;30(12):1433-40. [PubMed: 15959374]. 25. Smeets RJ, Maher CG, Nicholas MK, Refshauge KM, Herbert RD. Do psychological characteristics predict response to exercise and advice for subacute low back pain? Arthritis Rheum. 2009;61(9):1202-9. doi: 10.1002/art.24731. [PubMed: 19714601]. 26. Hall H, McIntosh G, Boyle C. Effectiveness of a low back pain classification system. Spine J. 2009;9(8):648-57. doi: 10.1016/j.spinee.2009.04.017. [PubMed: 19501026]. 27. Slater SL, Ford JJ, Richards MC, Taylor NF, Surkitt LD, Hahne AJ. The effectiveness of sub-group specific manual therapy for low back pain: a systematic review. Man Ther. 2012;17(3):201-12. doi: 10.1016/j.math.2012.01.006. [PubMed: 22386046]. 28. Surkitt LD, Ford JJ, Hahne AJ, Pizzari T, McMeeken JM. Efficacy of directional preference management for low back pain: a systematic review. Phys Ther. 2012;92(5):652-65. doi: 10.2522/ptj.20100251. [PubMed: 22247407]. 29. Van Dillen L, van Tulder M. Targeting interventions to patients: development and evaluation. In: Cholewicki J, Dieen JH, editors. Spinal Control. Churchill Livingstone; 2013. p. 195-205. 30. Riddle DL. Classification and low back pain: a review of the literature and critical analysis of selected systems. Phys Ther. 1998;78(7):708-37. [PubMed: 9672545]. 31. Bellamy J. Vision Statement for the Physical Therapy Profession and Guiding Principles to Achieve the Vision. American Physical Therapy Association; 2013. 32. Sahrmann SA. The human movement system: our professional identity. Phys Ther. 2014;94(7):1034-42. doi: 10.2522/ptj.20130319. [PubMed: 24627430]. 33. Karayannis NV, Jull GA, Hodges PW. Physiotherapy movement based classification approaches to low back pain: comparison of subgroups through review and developer/expert survey. BMC Musculoskelet Disord. 2012;13:24. doi: 10.1186/1471-2474-13-24. [PubMed: 22348236]. 34. Beneciuk JM, Bishop MD, George SZ. Clinical prediction rules for physical therapy interventions: a systematic review. Phys Ther. 2009;89(2):114-24. doi: 10.2522/ptj.20080239. [PubMed: 19095806]. 35. Patel S, Friede T, Froud R, Evans DW, Underwood M. Systematic review of randomized controlled trials of clinical prediction rules for physical therapy in low back pain. Spine (Phila Pa 1976). 2013;38(9):762-9. doi: 10.1097/BRS.0b013e31827b158f. [PubMed: 23132535]. 36. Furlan AD, Malmivaara A, Chou R, Maher CG, Deyo RA, Schoene M, et al. 2015 Updated Method Guideline for Systematic Reviews in the Cochrane Back and Neck Group. Spine (Phila Pa 1976). 2015;40(21):1660-73. doi: 10.1097/BRS.0000000000001061. [PubMed: 26208232]. 37. Verhagen AP, de Vet HC, de Bie RA, Kessels AG, Boers M, Bouter LM, et al. The Delphi list: a criteria list for quality assessment of randomized clinical trials for conducting systematic reviews developed by Delphi consensus. J Clin Epidemiol. 1998;51(12):1235-41. [PubMed: 10086815]. 38. Hahne AJ, Ford JJ, McMeeken JM. Conservative management of lumbar disc herniation with associated radiculopathy: a systematic review. Spine (Phila Pa 1976). 2010;35(11):E488-504. doi: 10.1097/BRS.0b013e3181cc3f56. [PubMed: 20421859]. 39. Maher CG, Sherrington C, Herbert RD, Moseley AM, Elkins M. Reliability of the PEDro scale for rating quality of randomized controlled trials. Phys Ther. 2003;83(8):713-21. [PubMed: 12882612]. 40. de Morton NA. The PEDro scale is a valid measure of the methodological quality of clinical trials: a demographic study. Aust J Physiother. 2009;55(2):129-33. [PubMed: 19463084]. 41. Jadad AR, Moore RA, Carroll D, Jenkinson C, Reynolds DJ, Gavaghan DJ, et al. Assessing the quality of reports of randomized clinical trials: is blinding necessary? Control Clin Trials. 1996;17(1):1-12. [PubMed: 8721797]. 42. Pennant M, Takwoingi Y, Pennant L, Davenport C, Fry-Smith A, Eisinga A, et al. A systematic review of positron emission tomography (PET) and positron emission tomography/computed tomography (PET/CT) for the diagnosis of breast cancer recurrence. Health Technol Assess. 2010;14(50):1-103. doi: 10.3310/hta14500. [PubMed: 21044553]. 43. Cohen J. Statistical power analysis for the behavioral sciences (revised ed.). New York: Academic Press; 1977. 44. Higgins JPT, Green S. Cochrane handbook for systematic reviews of interventions. Wiley Online Library; 2008. 45. Atkins D, Best D, Briss PA, Eccles M, Falck-Ytter Y, Flottorp S, et al. Grading quality of evidence and strength of recommendations. BMJ. 2004;328(7454):1490. doi: 10.1136/bmj.328.7454.1490. [PubMed: 15205295]. 46. Schunemann H, Brozek J, Oxman A. GRADE handbook for grading quality of evidence and strength of recommendation Version 3.2. The GRADE Working Group; 2009. Available from: www.cc-imsnet/gradepro. 47. Browder DA, Childs JD, Cleland JA, Fritz JM. Effectiveness of an extension-oriented treatment approach in a subgroup of subjects with low back pain: a randomized clinical trial. Phys Ther. 2007;87(12):1608-18. discussion 1577-9. doi: 10.2522/ptj.20060297. [PubMed: 17895350]. 48. Fritz JM, Delitto A, Erhard RE. Comparison of classification-based physical therapy with therapy based on clinical practice guidelines for patients with acute low back pain: a randomized clinical trial. Spine (Phila Pa 1976). 2003;28(13):1363-71. discussion 1372. doi: 10.1097/01.BRS.0000067115.61673.FF. [PubMed: 12838091]. 49. Henry SM, Van Dillen LR, Ouellette-Morton RH, Hitt JR, Lomond KV, DeSarno MJ, et al. Outcomes are not different for patient-matched versus nonmatched treatment in subjects with chronic recurrent low back pain: a randomized clinical trial. Spine J. 2014;14(12):2799-810. doi: 10.1016/j.spinee.2014.03.024. [PubMed: 24662210]. 50. Petersen T, Larsen K, Nordsteen J, Olsen S, Fournier G, Jacobsen S. The McKenzie method compared with manipulation when used adjunctive to information and advice in low back pain patients presenting with centralization or peripheralization: a randomized controlled trial. Spine (Phila Pa 1976). 2011;36(24):1999-2010. doi: 10.1097/BRS.0b013e318201ee8e. [PubMed: 21358492]. 51. Saner J, Kool J, Sieben JM, Luomajoki H, Bastiaenen CH, de Bie RA. A tailored exercise program versus general exercise for a subgroup of patients with low back pain and movement control impairment: A randomised controlled trial with one-year follow-up. Man Ther. 2015;20(5):672-9. doi: 10.1016/j.math.2015.02.005. [PubMed: 25770419]. 52. Saner J, Sieben JM, Kool J, Luomajoki H, Bastiaenen CH, de Bie RA. A tailored exercise program versus general exercise for a subgroup of patients with low back pain and movement control impairment: Short-term results of a randomised controlled trial. J Bodyw Mov Ther. 2016;20(1):189-202. doi: 10.1016/j.jbmt.2015.08.001. [PubMed: 26891655]. 53. Sheeran L, van Deursen R, Caterson B, Sparkes V. Classification-guided versus generalized postural intervention in subgroups of nonspecific chronic low back pain: a pragmatic randomized controlled study. Spine (Phila Pa 1976). 2013;38(19):1613-25. doi: 10.1097/BRS.0b013e31829e049b. [PubMed: 23759804]. 54. Vibe Fersum K, O'Sullivan P, Skouen JS, Smith A, Kvale A. Efficacy of classification-based cognitive functional therapy in patients with non-specific chronic low back pain: a randomized controlled trial. Eur J Pain. 2013;17(6):916-28. doi: 10.1002/j.1532-2149.2012.00252.x. [PubMed: 23208945]. 55. Burns SA, Foresman E, Kraycsir SJ, Egan W, Glynn P, Mintken PE, et al. A treatment-based classification approach to examination and intervention of lumbar disorders. Sports Health. 2011;3(4):362-72. doi: 10.1177/1941738111410378. [PubMed: 23016029]. 56. Busanich BM, Verscheure SD. Does McKenzie therapy improve outcomes for back pain? J Athl Train. 2006;41(1):117-9. [PubMed: 16619104]. 57. Campbell CM, Edwards RR. Mind-body interactions in pain: the neurophysiology of anxious and catastrophic pain-related thoughts. Transl Res. 2009;153(3):97-101. doi: 10.1016/j.trsl.2008.12.002. [PubMed: 19218091]. 58. Frost H, Lamb SE, Stewart-Brown S. Responsiveness of a patient specific outcome measure compared with the Oswestry Disability Index v2.1 and Roland and Morris Disability Questionnaire for patients with subacute and chronic low back pain. Spine (Phila Pa 1976). 2008;33(22):2450-7. discussion 2458. doi: 10.1097/BRS.0b013e31818916fd. [PubMed: 18824951]. 59. Delitto A, Erhard RE, Bowling RW. A treatment-based classification approach to low back syndrome: identifying and staging patients for conservative treatment. Phys Ther. 1995;75(6):470-85. discussion 485-9. [PubMed: 7770494]. 60. Brown CA. The role of paradoxical beliefs in chronic pain: a complex adaptive systems perspective. Scand J Caring Sci. 2007;21(2):207-13. doi: 10.1111/j.1471-6712.2007.00457.x. [PubMed: 17559439]. 61. Luthi F. Chronic pain and activity: Avoidance, pacing... or persistence? Ann Phys Rehabil Med. 2016;59S:e52-3. doi: 10.1016/j.rehab.2016.07.120. [PubMed: 27676941]. 62. Edwards RR, Dworkin RH, Sullivan MD, Turk DC, Wasan AD. The Role of Psychosocial Processes in the Development and Maintenance of Chronic Pain. J Pain. 2016;17(9 Suppl):T70-92. doi: 10.1016/j.jpain.2016.01.001. [PubMed: 27586832]. 63. Vardeh D, Mannion RJ, Woolf CJ. Toward a Mechanism-Based Approach to Pain Diagnosis. J Pain. 2016;17(9 Suppl):T50-69. doi: 10.1016/j.jpain.2016.03.001. [PubMed: 27586831]. 64. Jazayeri SM. Study of Relationship Between Psycho-social Profile and Chronic Low-Back Pain (LBP). Iran Red Crescent Med J. 2006;2006(4):46-50. 65. Turk DC, Rudy TE. Towards a comprehensive assessment of chronic pain patients. Behav Res Ther. 1987;25(4):237-49. [PubMed: 3662986]. 66. Kent P, Mjosund HL, Petersen DH. Does targeting manual therapy and/or exercise improve patient outcomes in nonspecific low back pain? A systematic review. BMC Med. 2010;8:22. doi: 10.1186/1741-7015-8-22. [PubMed: 20377854]. 67. Dworkin RH, Turk DC, Farrar JT, Haythornthwaite JA, Jensen MP, Katz NP, et al. Core outcome measures for chronic pain clinical trials: IMMPACT recommendations. Pain. 2005;113(1-2):9-19. doi: 10.1016/j.pain.2004.09.012. [PubMed: 15621359]. 68. Maughan EF, Lewis JS. Outcome measures in chronic low back pain. Eur Spine J. 2010;19(9):1484-94. doi: 10.1007/s00586-010-1353-6. [PubMed: 20397032]. 69. Younger J, McCue R, Mackey S. Pain outcomes: a brief review of instruments and techniques. Curr Pain Headache Rep. 2009;13(1):39-43. [PubMed: 19126370]. 70. Beattie P, Maher C. The role of functional status questionnaires for low back pain. Aust J Physiother. 1997;43(1):29-38. [PubMed: 11676670].